For the Crab lover! A wood crab mallet that says, "B'More Crabby"! 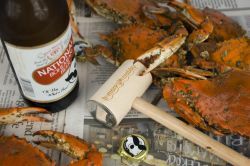 This awesome crab mallet is also a bottle opener. Dual functions! Designed and proudly Made in Maryland Hon!